To say that the internet is awash this week with news of the US presidential election, the culmination of several years of campaigning for both its parties and its population, would be a drastic understatement – one can scarcely open a link, pick up a newspaper or step into the street without unwittingly catching a glimpse of the heated political debate. 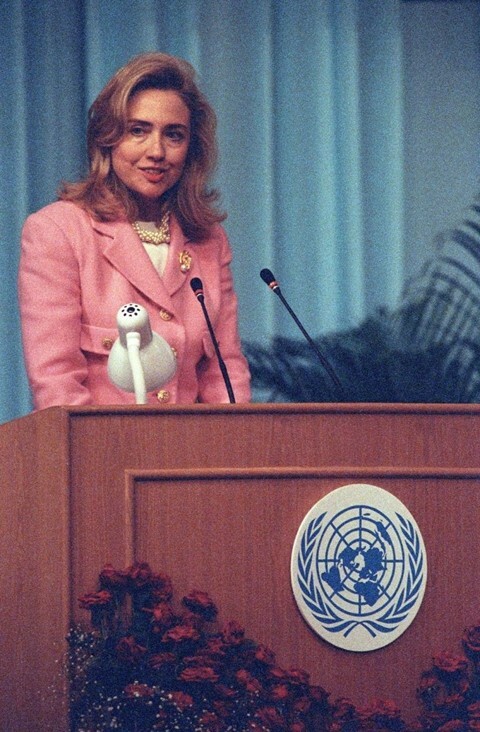 What better opportunity, then, to uncover this jewel of an image of Madam Secretary addressing crowds at the Fourth Women’s Conference in Beijing, China, in 1995? Wearing a pastel pink two-piece with fetching gold buttons, an elaborate necklace and beige suede court shoes in an especially vibrant example of her now-discarded, antiquated approach to power-dressing (one which was focused on “buying into the idea that for a woman to wield power in what was historically a man’s world, she had to pretty much dress like a man — but brighter!” as T: The New York Times Style Magazine’s Vanessa Friedman wrote this summer), the young politician speaks powerfully on the necessity of enforcing fundamental human rights for women. “However different we may appear, there is far more that unites us than that divides us,” she tells the assembly, unwavering in her delivery. “We share a common future and we are here to find common ground, so that we may bring new dignity and respect to girls all over the world.” Clever, charismatic, and unashamedly stylish, she is every inch a president.